Girl Scout cookies are just EVIL little cookies for any diet! I'm not a huge fan of boxed cookies but there is something about those Girl Scout Cookies that get me every time! 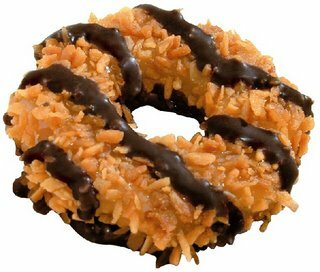 My favorite are the samoas or AKA Carmel Delights. I was good this year and bought only 4 boxes - 1) Tagalongs (2) Thin Mint (1) Samoas<--which I ate the whole box myself because I'm the only one who likes coconut in my house! Seriously, why are Girl Scout cookies so EVIL? What is it about these cookies that puts us into mindless overeating? I was a brownie and girl scout and even back in the day when I sold and delivered the cookies I can remember people even then saying well there goes my diet this week! These cookies for years have thrown us off our diets! Thankfully Girl Scout Cookies only happen once a year so it's just about two weeks of mindless delicious cookie eating before we get ourselves back on our diets! If you are looking to get creative with your box of cookies and make some girl scout cheesecakes or cupcakes, or attempt your hand at making your own in the off season here are some links below to check out for girl scout recipes! Girl Scout Cookie Cupcakes - Hoosier homemade shares with us a whole list of ideas using girl scout cookies into a cupcake! Samoas Cheesecake Bars - Baking Bites shares this fabulous recipe on how to make cheesecake bars!!! - I'm so thankful my box is gone or I would be making these delicious bars!! I love the idea behind the girl scouts of helping make these young girls more assertive, sales competitive, goal setting, money management, and people skills. So for that cause, I can toss my diet aside for a week and support the girl scouts and enjoy my box of Samoas once a year! So what are your favorite girl scout cookies?